*Editor's note: This story was updated on Jan. 28 to reflect the latest information regarding the citizenship review lawsuit. Hey, Texplainer: I think I might be on the state's list of voters flagged for citizenship reviews. How can I check? When state officials announced last month that they had flagged nearly 100,000 Texas voters for citizenship checks, many naturalized citizens wondered: Am I on the list? State officials compiled the names by comparing a list of registered voters with a Department of Public Safety list of legal residents who indicated they weren’t citizens when they obtained a driver’s license or ID card. So it stood to reason that many naturalized citizens would be on the list; most state driver’s licenses are renewed every six years, and Texas doesn’t require people to notify the Department of Public Safety when they become citizens in between. But state officials have kept the list secret. So the only way to find out if you’re on the list is to call your county elections office. However, not all counties are releasing information because of ongoing lawsuits over the citizenship checks. On Feb. 15, nearly a month after sending Texas voters and county officials into a commotion over suggested voter citizenship reviews, the secretary of state’s office emailed guidance clarifying how counties can inform registered voters if they were flagged and how to verify their citizenship. County officials may confirm to inquiring registered voters if they’re on the list, but only regarding the person asking. People can’t ask about the status of other voters. After confirming that a registered voter is on the list, county officials may inform the voter of the state’s options to verify citizenship. Under the Texas Elections Code, citizenship can be verified with a U.S. birth certificate, U.S. passport or citizenship papers, said El Paso County Elections Administrator Lisa Wise. Citizenship papers include a certificate of citizenship, which is given to a person born outside of the U.S. who acquired citizenship through a U.S. citizen parent, or a naturalization certificate, which is granted to immigrants at least 18 years old who have undergone the naturalization process, according to the federal U.S. Citizenship and Immigration Services. Local elections officials have access to a dashboard listing the names of the flagged voters and can cross off verified citizens, said Sam Taylor, the communications director for the secretary of state’s office. But there is still some confusion over the rules. A federal judge ordered all Texas counties to not remove any flagged voters from voter rolls. U.S. District Judge Fred Biery, who is overseeing three lawsuits over the flawed citizenship checks, wrote in his brief that counties may still "continue to find out if in fact someone is registered who is not a citizen, so long as it is done without communicating directly with any particular individual on the list." 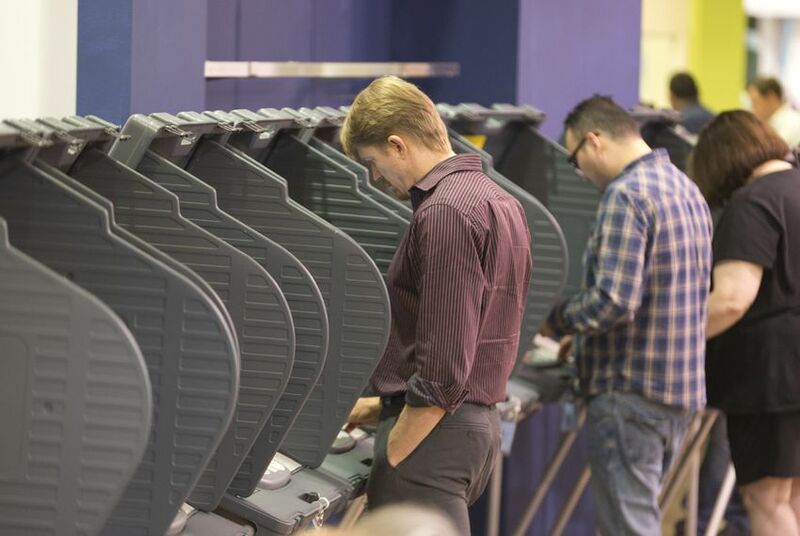 Under this new federal order for counties to not communicate with listed voters, Williamson County is no longer confirming if people are on the list, Williamson County Elections Administrator Christopher Davis told the Texas Tribune in an email. Earlier this month, Texas Attorney General Ken Paxton’s office also spurred confusion after the office told at least one county that it couldn’t release the list of flagged voters to the public, saying his office had opened an investigation file for voters flagged for citizenship review. While the attorney general’s office has not yet taken “significant investigative action” against the flagged voters, the office’s investigation file led El Paso County and Travis County to cite a portion of the Texas Public Information Act that states names that are part of a criminal investigation cannot be released. Under the secretary of state's new advisory, Travis County is now informing inquiring registered voters if they’re on the list, said Bruce Elfant, the Travis County voter registrar and tax assessor-collector. But Wise said in email Tuesday that her office is still not releasing any names and that officials are monitoring the court cases about the citizenship reviews. Many counties, including Travis County and El Paso County, held off on sending letters to flagged voters demanding that they prove their citizenship or be tossed from the rolls. Biery previously told fifteen counties that did send letters to hold off on removing anyone from the rolls while legal challenges to the citizenship review make their way through the courts. The lawsuits, filed by flagged voters and civil rights groups, allege the state and counties discriminated against naturalized citizens. The secretary of state’s new guidance to counties also says a voter’s registration must be reinstated immediately if the voter proves citizenship after being purged from the list for not responding to a notice of examination. Bottom line: If you’re worried about your voter registration, your best bet is to contact your local county elections office or voter registrar. It’s not guaranteed, but the secretary of state’s new guidelines could help you confirm if you’re on the list and help you verify your citizenship with local elections officials.